100 hours yoga teacher training 200 hours yoga teacher training 300 hours yoga teacher training 500 hours yoga teacher training Our Schedules Why Choose Us? At Yogkulam, we strive to offer authentic yogic knowledge through systemic yoga teacher training in Rishikesh,India. We are registered with the reputed Yoga Alliance,USA to provide 100 hour,200 hour,300 hour and 500 hour yoga teacher training in India. With the most competent faculty on board, our 200 hour yoga teacher training in Rishikesh,India is a boon for all aspiring yoga teachers, especially beginners. 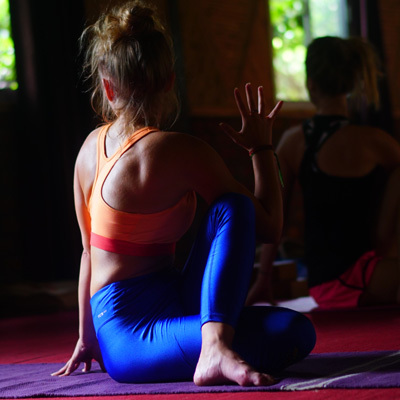 For regular practitioners we offer 300 hour yoga teacher training in Rishikesh,India that has been designed to elevate your yogic skills and deepen your knowledge. Our courses intend to channelize your inner energy in order to bring out the best version of yourself. We aim at creating self aware, skilled and humble yoga teachers through all our yoga teacher programs. Our yoga courses meet international guidelines without compromising the ancient yogic knowledge. We are proud to have our roots in Rishikesh-the world capital of Yoga. Our campus boasts of a quaint and peaceful ambience which aids in mindful yoga learning. With that said, Yogkulam leaves no stone unturned to make your yoga teacher training in Rishikesh the most memorable experience of your life. Small group: The batch size is kept small to make sure undivided attention is paid to every student. This also makes it easier for students and teachers to interact more. Food: Yogkulam provides special satvik food or what we call a yogic diet to our students. It is hygienic,detoxifying and highly nutritious. If any student is allergic to any product, we also arrange a separate diet for them. Accommodation: We offer a home like accommodation with all basic facilities in our campus. Clean and airy rooms with sufficient natural light would make for a comfortable stay during your YTTC in Rishikesh. Teachers: Our faculty of highly proficient yoga teachers is the backbone of our school. They are all certified and masters of their subjects. With their friendly nature, they make all students extremely comfortable during their course. Curriculum: The curriculum consists of daily classes for both theoretical and practical subjects of yoga. Regular classes for asanas,dhyana and pranayama along with contemporary subjects like yoga anatomy, physiology etc are included in the yoga teacher training program. Teaching methodology: We combine modern teaching methods along with traditional yogic knowledge for a comprehensive yoga teacher training. We stress on developing teaching skills of our students so that they can conduct their own yoga classes dynamically. Alignment adjustment: Alignment and adjustment during yoga asana practice is given special attention so that students can reap maximum benefits out of their practice. We also make use of props and other equipments to improve body postures and avoid injuries. Other activities: Along with classes, weekly excursions are a much celebrated part of our yoga teacher training program. White water rafting in river Ganges, local sightseeing and other fun activities are conducted on weekly basis to break the monotony for students. Discover your spiritual self while you experience the glory of yoga and meditation in the most magical ambience provided by nature. 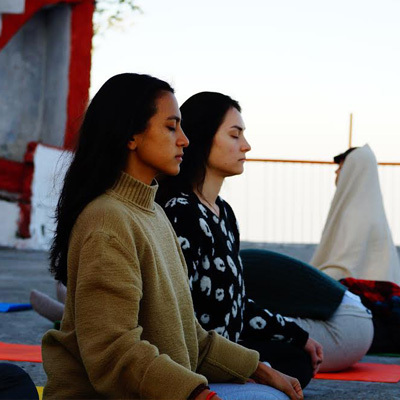 Find yourself surrounded by the majestic Himalayas as you rejuvenate your body and mind on the banks of the holy Ganges with a refreshing yoga retreat at Rishikesh Yogkulam in Rishikesh,India. Yogkulam is a renowned yoga school in Rishikesh,India. We are affiliated to Yoga Alliance,USA to provide competent yoga education to all aspirants. We offer certification for 100 hour, 200 hour and 300 hour yoga teacher training in India. Along with teacher training courses, we also host 5, 7 and 10 day yoga retreats for people to get a taste of yogic culture. With a strong background of yoga education, our certified yoga teachers aim to spread the goodness of yoga through their teaching. Situated in the holy town of Rishikesh, the campus of Yogkulam will welcome you with a pleasant vibe the moment you step in. As a yoga school in India, we make sure to deliver the best hospitality to all students coming from all parts of the world. This principle also reflects in our name. The word ‘Yogkulam’ is made up of Yoga and Kul which translates to aggregating all aspects of yoga to form a yogic family. Freshly cooked satvik food prepared in traditional ayurvedic way.